We will show you step-by-step how to take your measurements correctly. So there’s nothing stopping you from giving your measurements correctly, for example, for your individual tailor-made shirt. 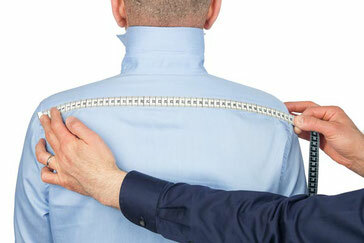 Collar: Place the tape measure where the collar will later sit (just below the Adam’s apple). Add a finger breadth to that so that the collar does not sit too tight and later cuts into you. Chest: Run the tape measure under the armpits to measure the width of the chest. 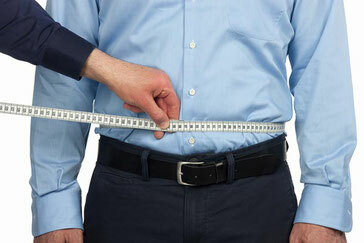 Waist: Place the tape measure on the body around the height of the belly button. 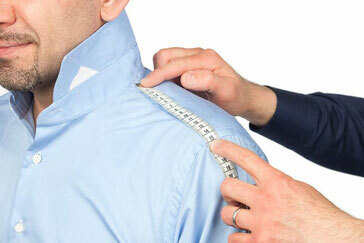 Shoulders: Measure between the beginning of the neck and the shoulder tip (the end of the shoulder bone). Sleeve length: Measure from the outer edge of the arm to the middle of the back of the hand. 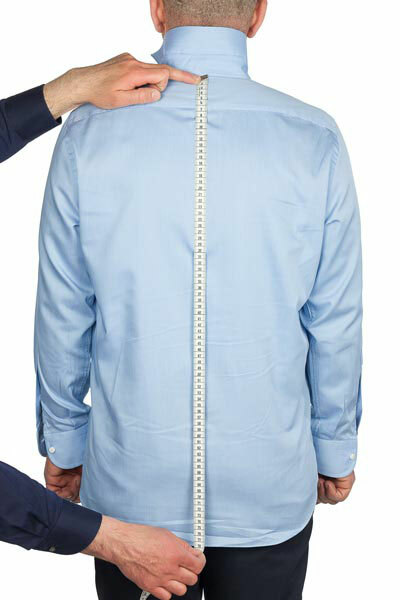 Back: Following the shape of the body, measure from one shoulder to the other in a light bow form (starting on each side at the end of the shoulder bone). 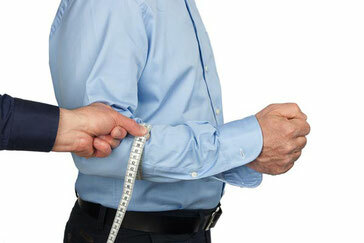 Wrist with watch: Measure the width of the wrist with watch on (add another finger width). 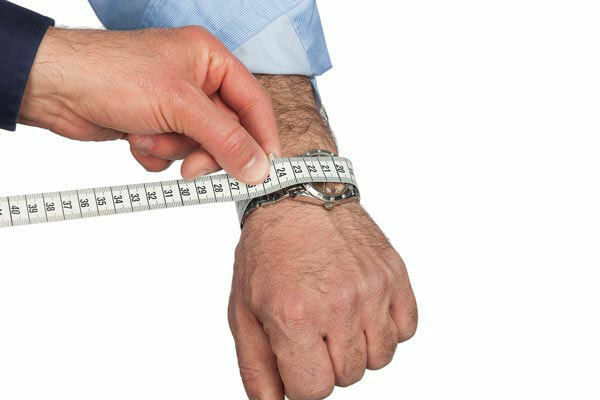 Wrist: Measure the width of the wrist (add another finger width). Circumference of upper arms: Measure the circumference of the upper arm over relaxed biceps. 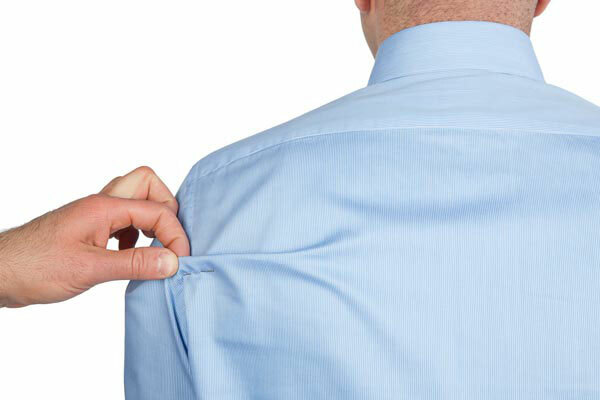 Rounded shoulders: If diagonal creases develop on the back to the lower armpit area (originating from the neck and shoulder points), then please use a pin to tack away the excess fabric horizontally. The amount of the fabric you have pinned away yields the value for the so-called “rounded shoulders”. 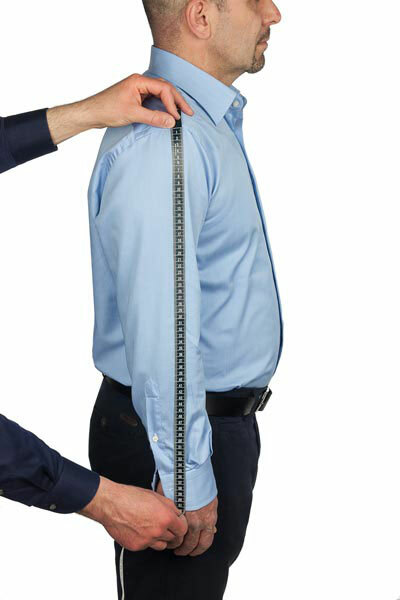 The values can be different on the right and left (guideline values: slightly rounded shoulders: 1 cm; strongly rounded shoulders: 4 cm). 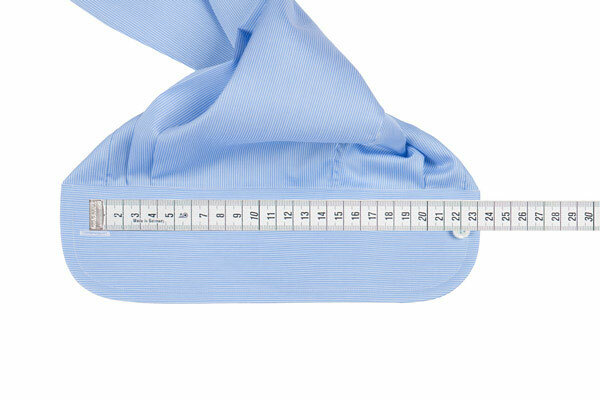 Shirt chest: Run the tape measure across once below the armpit seam. 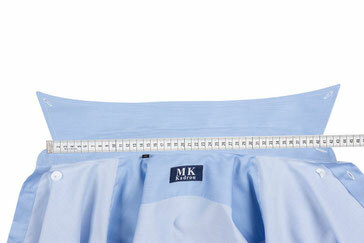 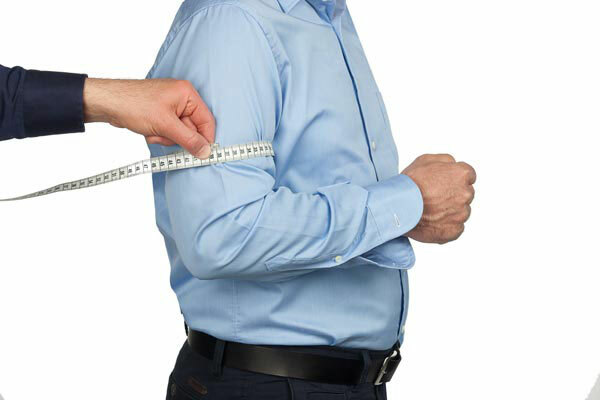 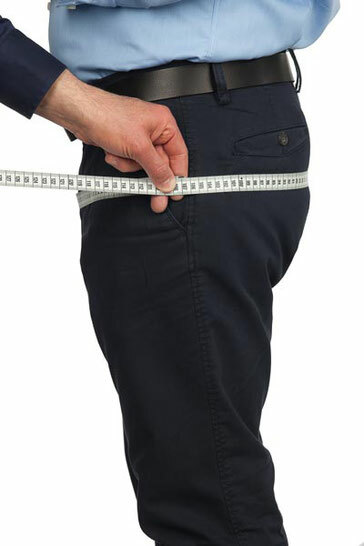 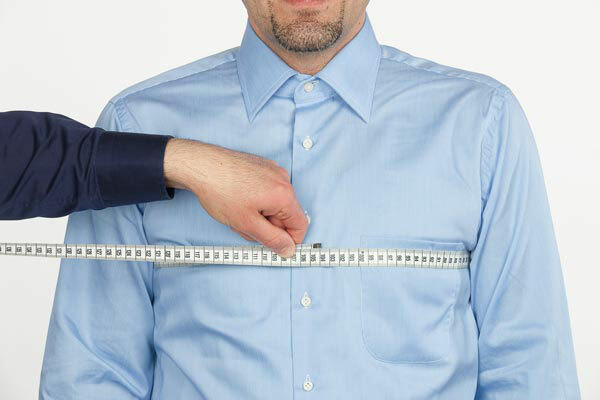 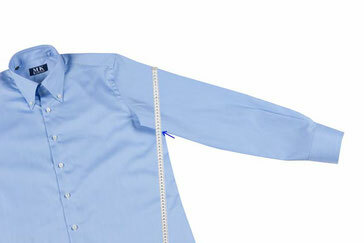 Shirt waist: To take the waist measurement, run the tape measure across the narrowest part of the shirt. Shirt hips: To take the hip measurement, run the tape measure across the shirt. Shirt sleeve length: Measure the length of the sleeve from the seam where the shoulder and sleeve join until the end of the cuff. 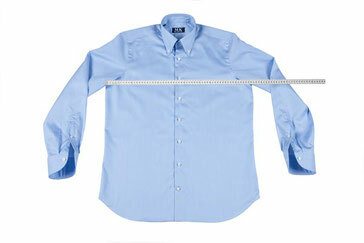 Shirt upper arm: Run the tape measure across the sleeve at the largest part (about in the middle of the upper part). 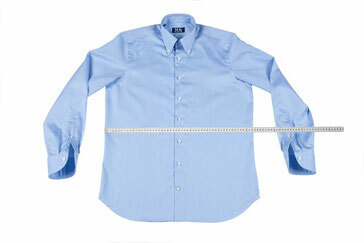 Shirt forearm: Run the tape measure across the sleeve at the forearm. 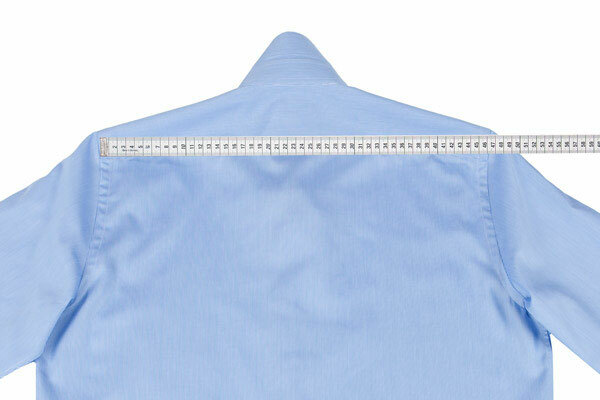 Shirt shoulders: Measure the distance between the shoulder tips. Shirt neck: Measure the distance between the collar edge and the back transverse seam. Shirt back: To measure the length of the shirt, run the measuring tape from the lower edge of the collar all the way to the end of the shirt. Shirt collar width: Measure once across the collar from the middle of the button to the end of the opposite buttonhole. 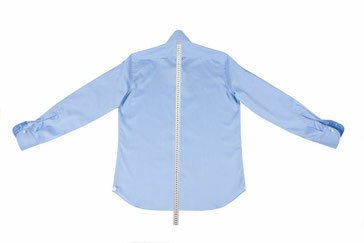 Shirt Collar 2: In the middle of the collar, measure the distance between the back seam and the end of the collar. 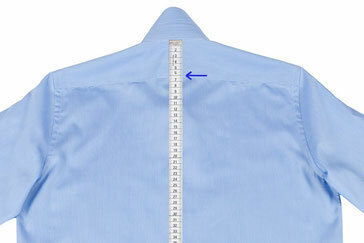 Shirt Collar: Measure the distance between the nape seam and the collar edge (side length). Shirt cuffs: Measure from the outer end of the buttonhole to the middle of the outermost buttons on the opposite side. If you wear a wristwatch, then add on 1 - 2 cm. Would you like to know which detailing options we offer? 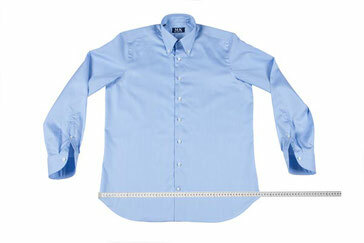 Please look at our selection; we’re also happy to offer advice by phone.